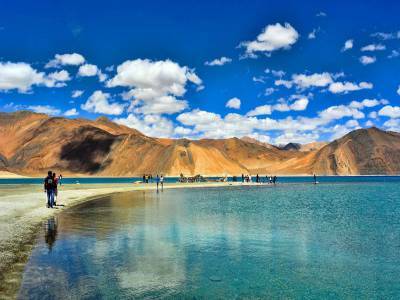 Pangong Tso also called the Pangong Lake can be reached in about 5 hours from Leh. The road leading to the lake is a very rough one. It crosses some small villages and stretches across Chang La where the army officials reside. This spectacular lake is open to the visitors from May to September. 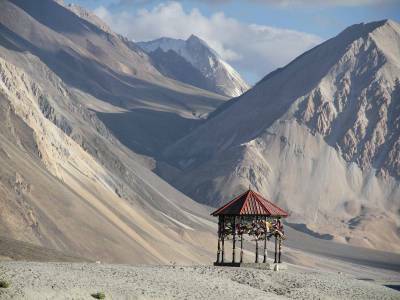 Pangong is a beautiful mysterious place surrounded by very high mountain cliffs. The water of the lake changes its colours throughout the day and the sight is breathtaking. The Pangong Lake is internally drained and does not have an outlet. Pangong Tso meaning high grassland lake in Tibetan is located at an altitude of above 4,300 metres. It is an endorheic lake and extends for a length of approximately 130 km from India to China. More than half of the lake is in China. 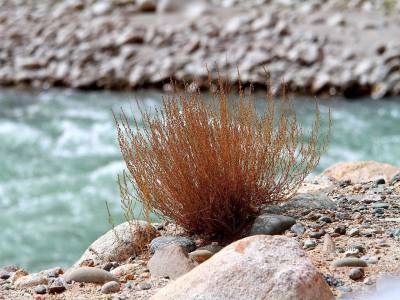 Although it constitutes brackish water, it freezes completely during the winters. The Pangong Lake is about 5km at its widest point and covers 604 km2 of the area in total. Tents are available near the lake for staying which cost around Rs. 1000. The saline waters of the lake support very less micro-vegetation. It is reported that there is hardly any aquatic life in this lake excluding some small crustaceans. Despite having less aquatic life, a number of ducks and gulls are found by the tourists on the surface of the lake or over it. A few shrubs and herbs grow in the swamps around the lake. The Pangong Lake will soon be recognized under the Ramsar Convention as a water body of international significance and is going to be the first such lake covering two nations in South Asia under this convention. India does not allow boating for security reasons. The main reason behind the low biodiversity in the lake is because of the severe environmental conditions and salinity. The lake serves as an important breeding ground for some migratory birds. The bar-headed goose and ducks are frequently seen here during the summers. The Ladakhi Marmots have made the surroundings of the lake their habitat. Two streams sustain this lake from the Indian side creating marshes and swamps at the edges. 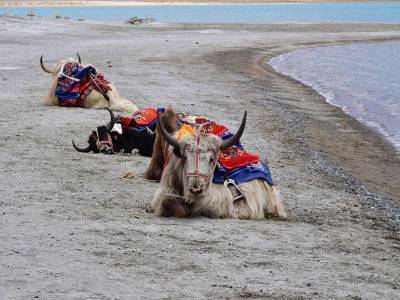 Get quick answers from travelers who visit to Pangong Tso (Pangong Lake).